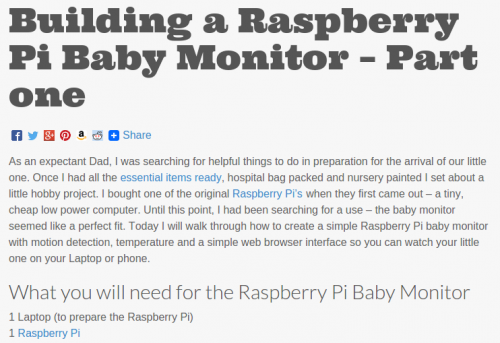 In common with geeky new parents before and since, blogger Baby R’s Dad felt inspired by the imminent arrival of his child to make something to monitor all the sleeping he hoped the infant would be doing. It really spoils your enjoyment of the three-year-old Nordic Noir you’re finally watching if, on top of your partner’s commentary of, “I don’t feel like watching this,” “Why would anyone watch this?” and “I don’t understand how someone who has to hold my hand during Doctor Who can cope with watching this,” you have to deal with nagging worries about whether the baby you last checked on a full eight minutes ago is still slumbering contentedly. So I was interested to see how Baby R’s Dad, one half of blogging parent duo Stuff Babies Need, had approached the problem. He uses a Raspberry Pi with a USB webcam and the motion package in a very simple set-up that gives you a live stream you can view from a phone or laptop on your local network. It also saves still images and video whenever it detects motion. Baby R’s Dad supplies instructions that take you from buying a Pi and peripherals, through preparing your SD card, to viewing the live stream. A planned second tutorial that would extend the system to include things like temperature monitoring isn’t available at the moment; happily, though, temperature monitoring is an ideal beginner project that we’ve covered previously on the blog. If it’s your parents you need to keep tabs on rather than a baby, our Parent Detector resource has you covered, too. Handy, but a bit on the expensive side for a baby monitor, don’t you think? Then where would the geek factor be if you didn’t make it yourself? Sure they are cheaper (& some are even more insecure, but that’s off topic) but thats no fun at all. And DoingItYourself means you can add extra features, that you wouldn’t find on commercial baby monitors. And DoingItYourself means you can add extra features, that you wouldn’t get on commercial baby monitors. I think audio-only baby monitors start around $25, but the one we got with video was almost $200 as I recall. The update rate was only 1 frame per second or so, and the audio wasn’t very sensitive. I think you could do a RPi-type solution with a USB camera around that price with much superior performance and obviously, completely configurable. Thing is, when baby shows up and you start using it, you may not be in the best frame of mind to continue debugging and system development for a while. Quality option though if you’re concerned about security! Baby monitors are notoriously bad for security. Proud Dad ! Well done !